We engaged in providing the quality items with good price and best service for you. PERFECTLY FIT YOUR DEVICE ,Perfectly fit for the ports of Apple Macbook . 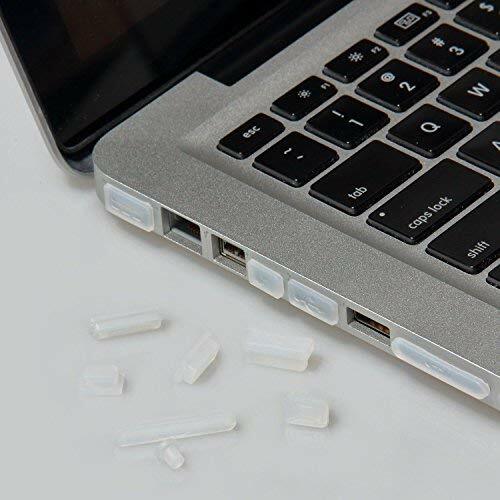 PROTECT YOUR MACBOOK ,FROM DUST OR DIRT With 9 pieces of plugs which will protect your laptop device from different of dust, lint or dirt. ECO-FRIENDLY SILICONE MATERIAL ,The anti-dust plugs are made of high quality durable silicone material which is eco-friendly, non-toxic and no harm to the body. WASHABLE AND REUSABLE ,The silicone plugs can be washed by soft soapy water and make them as clean as a new ones. Just remember to insert it back to your computer when it get dry enough. 1 x 9pcs/Pack Of Anti-dust Plug. 1.Anti-dust Plugs only, Macbook NOT included. 2.Colors may not appear exactly as seen on photo, due to variations between the computer monitors and naked eye color difference.